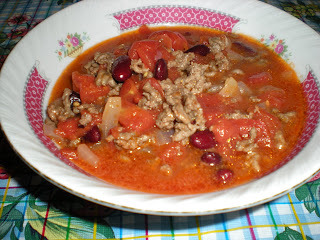 Here is a basic, non fancy chili recipe. Some suggest that it is better to undrain kidney beans. I actually drained to lower the sodium content. Let me know if it is better to drain or not to drain. 1. Brown ground beef and onion, drain fat. 2. Add tomatoes, tomato soup and seasonings . 3. Simmer, uncovered for 20 mins. 4. Add kidney beans and simmer for 10 mins. Sour Cream Doughnuts and "Doughbits"